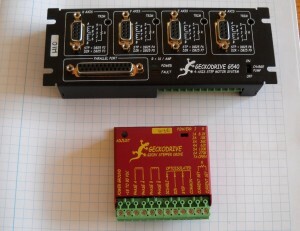 I have some projects coming up that will need a fourth axis, so I needed to buy a 4 axis motor controller. I tried a cheap Chinese Toshiba TB6560 based drive a while back and had a bad experience. 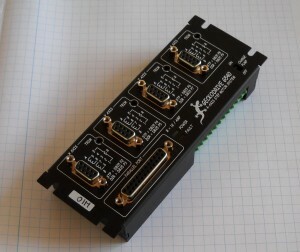 A good controller is not all about current, voltage or step size. What you really want is smooth running motors. 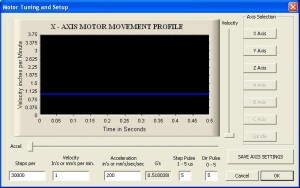 Some controllers have such bad resonance that the motors shake and jump and miss steps. Some are so bad they are vitually unusable at low speeds. Some have horrible inconsistent motor noise even when stopped. 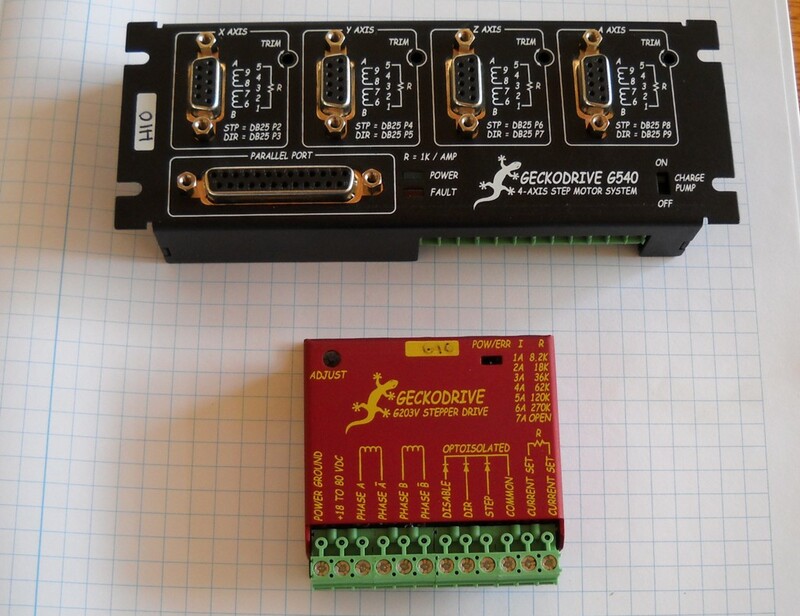 I have had great luck with my Geckodrive G203V Stepper Drivers on my big 1200 oz/in motors for my router and those motors have a reputation of being tough to control. Therefore, I decided to give the G540 4 Axis Drive a try. It retails for $299, but you can usually find a street price of about $250. I found a good price at Kelinginc.com and found they had a “will call” option for delivery. They are in the area so I decided to give them a visit. I met with the owner, John. He was very friendly guy and we chatted for about 30 minutes and he gave me a tour of the place. I have no trouble recommending him to anyone. Tell him I sent you. The controller is rather small at 6.375 x 2.375 x 1.25. Below it is pictured with a G203V. The motors connect using solder cup 9 pin D connectors. I actually prefer this to terminal blocks. I am always afraid a wire is going to break at the terminal block or a stray wire strand is going touch something it is not supposed to. Strain relief is nice too. The current for the motors is set via resistor on the connector. That has the nice feature of keeping the current setting with the motor. If it is moved around you always have the right setting. 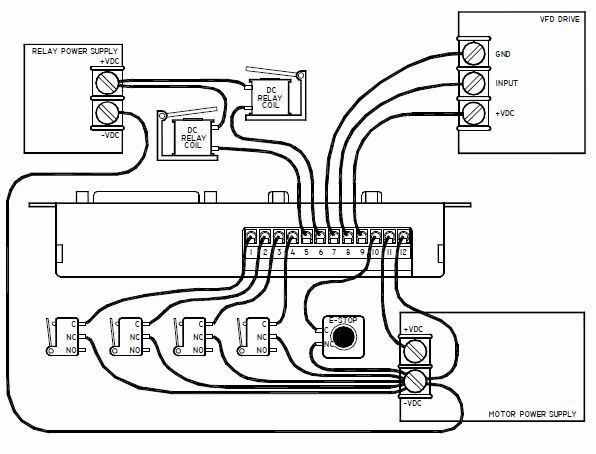 The only draw back is that quick pin swap that is sometime necessary to get the right direction, but most software can take care of that. 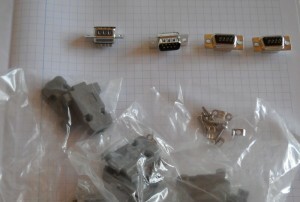 I started by installing the connectors onto the motor leads. I soldered each motor wire in place and put heat shrink tubing over the solder joints. 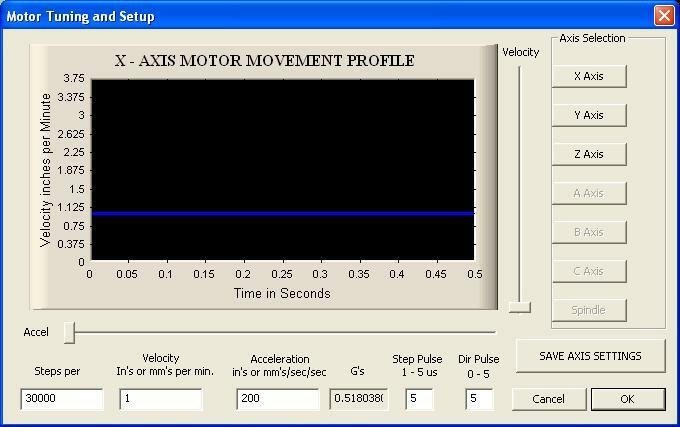 My motors are 1.68 Amp max. I put a 1k Ohm and a 680Ohm resistor in series because I did not have the correct value for a single resistor. 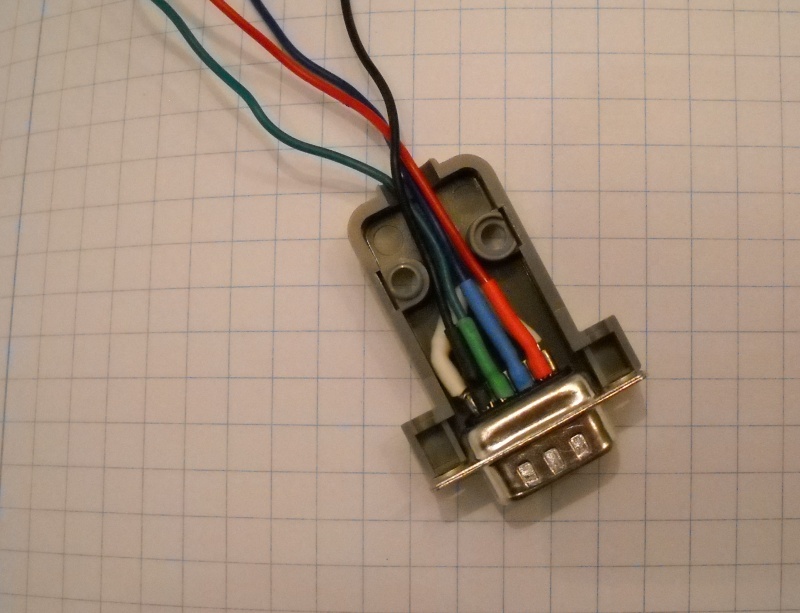 After I did the first connector, I realized the heat shrink was probably overkill so I did not put it on the rest. Next, I wired the main terminal block. I am using this on my laser so, all I needed for the test was power (+28V), GND and laser enable. 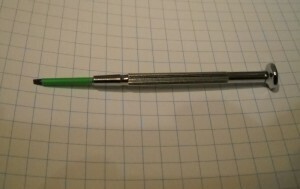 I shorted the E-Stop(pin #10) pin directly to ground (pin #12). I like my E Stop to only disable the laser. That way I can jog around with cover open and the laser disabled. I hooked my laser enable to Output 1 ( pin #5). 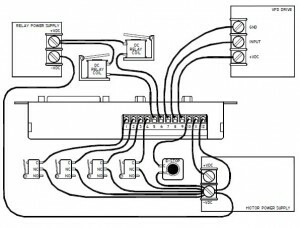 below is the schematic from the manual (not my setup). Next, I attached all the connectors. To my surprise the parallel port connector was female. This is typically male because the computer port is female. I thought this would bring me to a screeching halt, but 10 seconds of digging in my cable bucket yielded 2 of them. I guess they are pretty common, but if I have any hoarding tendencies it is with stuff like cables….see, I needed it. I connected it to my computer and fired up Mach3. I then powered up the G540. It has a red fault light and a green power light. The fault light lit for about 1/2 second then the green light lit up. All motors held firm and silent. I moved the motors back and forth a few times, They were as quite as I ever heard them and smooth all the way down to stop. I then needed to use the trim pots to fine tune them. I could find nothing in the documentation on how to do this. I know from experience the basic drill, but I Googled G540 trim pot anyway. 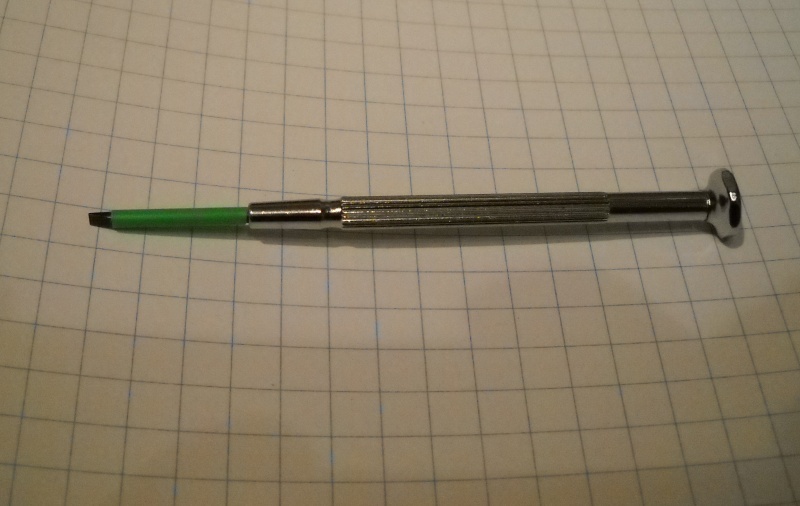 A hit at CNC Zone suggests 1/4 rev/sec was a good speed to use and to use an insulated screwdriver. I did not have one so I put a little heat shrink on one. I setup Mach3 to jog at 1/4 rev/sec. I set the max speed to 1 and a quick accel. It already sounded pretty damn smooth to me and I was having trouble getting the screwdriver to hit the pots. I almost decided to blow it off, but I did it anyway. I am glad I did because I was able to tweak a little more smoothness out of each one. Conclusion: A damn good driver, easy to setup, but 25pin female??. GREAT review and almost a tutorial. Loved the extra pictures. Just wanted to say THANK YOU. Hey, I work at Geckodrive and just wanted to explain why exactly the port is female on the G540. We put a lot of thought into everything we make and this was done to avoid costly problems on the user end. Because all solder used is lead free it has a higher melting temperature, which makes rework on things like a DB25 near impossible. If there was a male DB25 on there and one of the pins got damaged it would make the drive either 1.) not work as advertised, or 2.) not work at all. 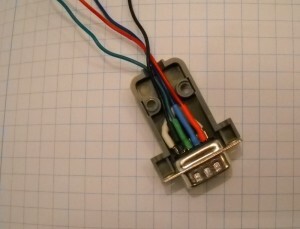 We chose the female connector as the lesser of two evils because it is slightly more rugged and forgiving. Also, all drives sold after May 2012 have easier to adjust trimpots so you don’t have to go poking around in the dark trying to smooth out your motors. We fixed this because of customer feedback telling us how difficult they were to adjust. Thanks, and happy cutting! This entry is filed under CAM, Digital Fabrication, DIY, Review . You can follow any responses to this entry through RSS 2.0 . You can leave a response, or trackback from your own site.